Fancy Forest, I have about half the blocks done but I would love to finish it this year. I have a large list of UFO's, about 56 projects. I have been keeping track of them for a few years now and review them every couple of months. Sometimes I am adding in new project and sometimes I get to mark a project as done. The finished projects get moved to a list of completed projects for the year. Then I know when I finished it too. Grand Illusion Mystery quilt, top is now done and waiting to be quilted. Not sure I have a photo of the finished top. 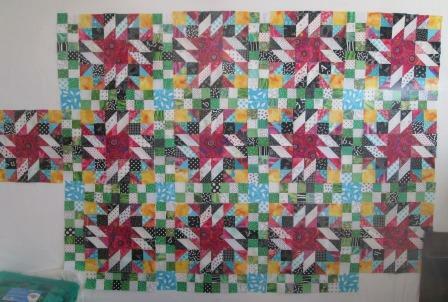 Christmas Postage Stamp Quilt, I hope to have this quilt completed in time for a Quilt show this year. My Goal to finish this year, in light of there being 2 local quilt shows. I need to enter some finished work. One quilt show is in June, Edmonton Guild then in October is the Leduc Quilt show. Slab blocks with Canadian fabric in it. Alletaire Mystery quilt is in this state now. I would like to get the top complete soon but I may not finish the quilting too quickly as other are on the list first. KFC log cabin started in a swap, all blocks done, needs design wall work. Scrappy Trips Around the world in KFC Reds blocks done needs to be put together. 3/4" hexagons started in the RSC what to do next? My list of UFOs still has another 35 quilts listed but not listed here today. Some will get worked on and a few I may not go back to. I am not ready to give up on them yet. Someday I might give away or sell some of the partly done quilts.